Artichokes are grown for their tender, edible flower buds. They have large, silvery-green leaves and thick stems. They're really quite impressive. I always love driving through the vast fields of artichokes in Castroville. It seems like an endless sea of artichokes, all standing up straight and tall like soldiers in a row. While most people might grow artichokes for the tasty treats sitting on top of the stems I’ve also seen several gardens where they are grown ornamentally. The bright purple flowers are stunning and make an interesting addition to the perennial garden. Artichoke plants are incredibly easy to grow. They thrive best where winters are mild and summers are warm. They do like a bit of summer fogginess, but to be honest, they do quite well here in the heat of the San Fernando Valley. They can produce harvests for up to 5 years. I cut my plants back each winter and they are full and lush by Spring. 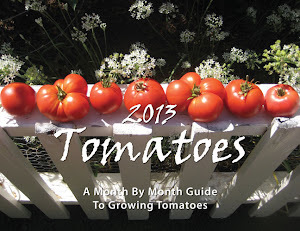 In colder climates, you have to treat them as annuals and re-plant in the Spring. Buy artichoke plants at the local nursery after the last danger of any frost. Artichokes grow best in rich, well-drained soil. Choose a site that gets full sun. Plants grow to be 4- to 5 feet tall so be sure they are sited where their shade won’t be harmful to any other plants. When you plant artichokes, dig the soil deeply, and add plenty of organic matter. I always put two large handfuls of fertilizer in the hole when I plant. I also add two tablespoons of John and Bob’s Soil Optimizer. This helps get the nutrients in the fertilizer to the plant faster, aids in water retention and helps feed the beneficial bacteria in the soil. I don’t plant anything without my John and Bob’s. 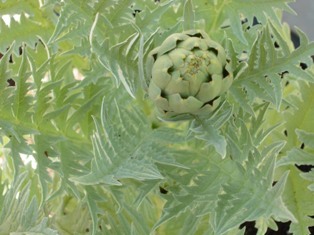 After artichokes are established and new growth appears, fertilize plants once a month. 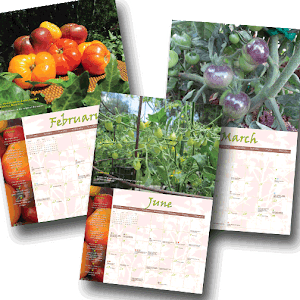 Keep soil moist throughout the growing season. Artichokes are heavy feeders and you can also apply a high-potassium fertilizer every 2 weeks during periods of active growth to encourage flower buds to form. Harvest artichokes before the buds start to open and they're still green and tight. The central bud usually ripens first. The side buds are usually smaller and ripen later. Squeeze juice from lemon halves into bowl of cold water. Cut stems off artichokes, leaving about 1 inch. Snap off bottom 3 rows of leaves. Cut off tips of artichokes and trim tops of remaining leaves. Halve artichokes lengthwise. Scrape out chokes. Place in lemon water. Bring large pot of salted water to boil. Add artichokes and boil until crisp-tender, about 6 minutes. Drain; pat dry. If preferred, you can steam the artichokes until just tender. Prepare barbecue (medium heat). Slowly add oil to1/3 cup lemon juice, combining with a whisk in small bowl. Brush artichokes with some of dressing. Grill until tender and charred in spots, about 5 minutes per side. Transfer to serving bowl or platter. Season remaining olive oil/lemon mixture with salt and pepper as desired. Pour dressing into small bowl and serve alongside grilled artichokes.